The family advice we hear in today’s readings – for mothers, fathers and children – is all solid and practical. Happy homes are the fruit of our faithfulness to the Lord, we sing in today’s Psalm. 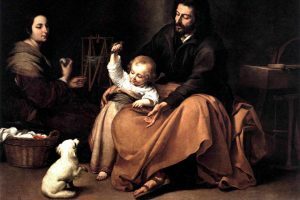 But the Liturgy is inviting us to see more, to see how, through our family obligations and relationships, our families become heralds of the family of God that He wants to create on earth. In what Jesus calls “My Father’s house,” every family finds its true meaning and purpose (see Ephesians 3:15). The Temple we read about in the Gospel today is God’s house, His dwelling (see Luke 19:46). But it’s also an image of the family of God, the Church (see Ephesians 2:19-22; Hebrews 3:3-6; 10:21).